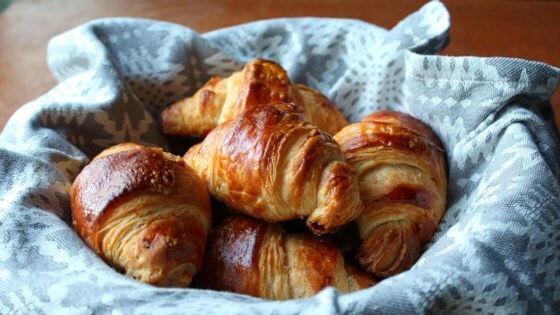 "I wouldn't describe making homemade croissants as easy since there are multiple steps, and it does take at least half a day. But it's really not that hard either; and certainly simpler than flying to Paris, which is the only other way to enjoy these amazing pastries. This recipe was adapted from one by Bruno Albouze, from The Real Deal (which he is)." Place warm water in the bowl of a stand mixer. Sprinkle with yeast. Let yeast dissolve for 10 minutes. Add sugar and bread flour. Sprinkle with salt; add 6 tablespoons butter. Attach the bowl to the stand mixer. Mix dough with the dough hook just until butter is completely kneaded in and the dough forms a ball and pulls away cleanly from the sides of the bowl, 3 or 4 minutes. Cut 2 sticks butter in half lengthwise and place slightly apart from each other on a length of parchment paper long enough to fold over the butter. Fold the parchment paper over the butter. Press butter down. Roll out with a rolling pin to a square about 8x8 inches. Refrigerate until a little chilled and just barely flexible, 10 or 15 minutes. Cut dough in half lengthwise using a pastry wheel or pizza cutter. Dust one piece with flour and roll out to a rectangle about 1/4 to 1/8 inch thick. Starting from one corner, cut the dough diagonally crosswise into 8 triangles using a pastry wheel. Starting with the bottom end of each triangle, roll each up toward the tip to form the croissant with the seam at the bottom. If necessary, use a bit of water to seal the tip to the rolled croissant. Place shaped croissants on baking sheets lined with silicone mats. Whisk together egg and 1 tablespoon water to make the egg wash. Brush croissants with egg wash. Place in a warm area to allow them to rise, about 45 to 60 minutes. Preheat oven to 400 degrees F (200 degrees C). Brush croissants gently but thoroughly again with egg wash.
Bake in preheated oven until beautifully browned, about 25 minutes. Transfer to a cooling rack. Cool to room temperature before serving. This is actually the quick version in that we're not leaving the dough to rest overnight before laminating with the butter. I didn't expect to have my result to look as well as the video, but I did expect them to task good. Mine came out over salted (I used unsalted European style butter) and overdone. Very good! The video tutorial was extremely helpful. I will make these again. This was a great recipe. Croissants are indeed challenging to make. Working with chilled dough requires discipline! But they are absolutely delicious. Really enjoyed these, though I thought the chocolate croissants were even better!